Jonathan Scales is a world traveler, bringing his unique brand of jazz fusion to audiences around the globe. 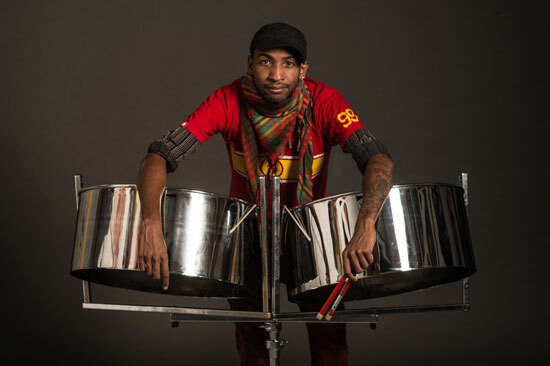 But even against that backdrop, the first half of 2017 has been an unusually active – and eye-opening – period for the steel pannist. To celebrate his 33rd birthday, Scales scheduled a rare hometown concert: the Jonathan Scales Fourchestra played the Asheville Music Hall on September 16. In late August, Scales played at the music camp run by celebrated bassist Victor Wooten. Just days ago, he gave a TEDx Talk about following through on life goals. The last time Scales played an Asheville date was November of last year. “And since then, I’ve been to Asia and Africa,” he says. Those trips was the result of Scales’ pursuing a major goal of his own. He successfully auditioned with the U.S. State Department in hope of being selected as a cultural ambassador. The success of that trip led to a further opportunity for Scales. He received a call from the State Department: “Do you want to go to Mauritania?” He readily agreed to put a group together and visit the West African country of over 4 million people. The cultural attaché in Mauritania eventually agreed, and took the Americans on a tour of the “real” Mauritania. “They made it their mission to take us around,” Scales says. He visited the local fish market, where fishermen brought in huge nets full of manta rays. He visited a home and was treated to a traditional dinner of camel. “Everyone sat on the floor, and ate from the same container, using their right hand,” he says. Scales developed the sense that whatever natural resources the country might have were being exported, and not much of worth was finding its way back to the citizens of Mauritania. “You could tell that the opportunities we have are just not there,” he says. You may also enjoy my previous interview with Jonathan Scales.